MONTEREY, Calif. (BRAIN) — SRAM has acquired the PowerTap line of bicycle power meters from Saris. The product line includes the PowerTap P2 Pedal power meters and the PowerTap G3 Hub power meter line. Terms of the deal are not being disclosed. PORTLAND, Ore. (BRAIN) — Custom wheel building company Sugar Wheel Works is joining forces with custom bike builders Breadwinner Cycles. The companies are based blocks from each other in Portland. DENVER (BRAIN) — Denver-based Fly Pedals, which makes a platform conversion for clipless pedals, has been purchased by an investor who is looking to acquire other cycling accessory brands. Terms of the deal were not disclosed. SQUAMISH, British Columbia (BRAIN) — Canada-based mountain bike website Pinkbike has acquired the road cycling website CyclingTips.com from BikeExchange. Pinkbike, founded by Radek Burkat in 1998, claims more than 3 million unique visitors every month. NEW YORK (BRAIN) — Hammerhead, which launched the Android-based Karoo GPS bike computer last year, has closed on a a $4.1 million "Seed Plus" funding round. The investment was led by Primary Venture Partners and KB Partners. MILWAUKEE (BRAIN) — Harley-Davidson Inc. has acquired StaCyc Inc., a producer of electric balance bikes for kids. LOUISVILLE, Colo. (BRAIN) — The Flagg family, which owns SmartEtailing and is led by QBP founder Steve Flagg and his wife, Mary Henrickson, has purchased Wheels Manufacturing, a U.S. manufacturer of service and repair parts. 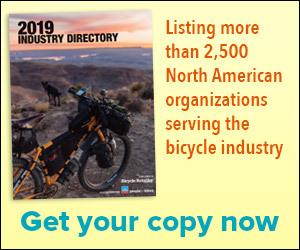 PARK CITY, Utah (BRAIN) — Park City Bike Demos, a Utah retailer that operated with an unusual business model, has been acquired by Robert DeMartini, the new CEO of USA Cycling and former CEO of New Balance. BATH, England (BRAIN) — U.K.-based publisher Future plc. has announced plans to buy CyclingNews.com and Procycling magazine from Immediate Media Co.
SCHAFFHAUSEN, Switzerland (BRAIN) — Garmin Ltd. announced Tuesday that it has reached a deal to acquire Dutch indoor smart trainer company Tacx. The deal is expected to close during the second quarter of 2019. The terms of the deal will not be disclosed, Garmin stated. NEW YORK (BRAIN) — American Media, LLC, best known as publisher of National Enquirer, Us Weekly and Men's Journal, has acquired the media assets comprising TEN: Publishing's Adventure Sports Network (ASN). The American Media Active Lifestyle Group will now include adventure and sports brands including Bike, Powder, Surfer, the Transworld titles, and Snowboarder. Acquisition brings VeloNews and BRAIN under the same management. BOULDER, Colo. (BRAIN) — Pocket Outdoor Media, best known for publishing VeloNews, has acquired Bicycle Retailer & Industry News from Emerald Expositions. BOCA RATON, Fla. (BRAIN) — Split Peak LLC, a private investment firm, has acquired Clean Designs, LLC, the parent company of Clean Bottle. Clean Bottle was launched in 2010 with a guerrilla marketing campaign at that summer's Tour de France and later appeared on the ABC series "Shark Tank."